If you are looking for a bow thruster or a stern thruster - or perhaps both, we have different sizes and models to suit most boats. You can also choose between DC electric units which are the normal for leisure boats, or if you have special needs, have a very large yacht or a boat that is used commercially the hydraulic thrusters and systems might be your best choice. 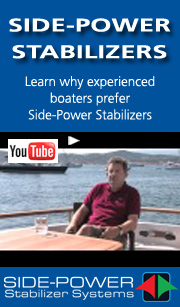 The difference between bow and stern thrusters is only the installation method so that the spesifications are the same for each thruster except for the installation measurements. If you require further assistance or quotes, please go to our "Contact" section to find your local dealer. If you want to know more about thrusters in general or the spesific advantages of Sidepower thrusters, please visit other sections of this site. Most product pages have a download spesifications sheet that you can save or print.